Occasionally, we get the strangest phone calls. No, not just surveys, or solicitors, or political fundraisers, (UGH!) or those of the creepy kind. Do any of those really work anymore? Sorry, got a little off track there. “Hi, I’d like to send a money-gram.” Um, nope. You need to call Western Union for that. “Can you put lettering on a trophy?” No, that’s engraving on a metal object. “I’m looking for somebody to put raised letters on my iPad cover.” Sorry, that’s embossing. “I want my wedding date put on a glass jar.” That is called etching. “Hi, I need to schedule a mammogram.” Boy, do you have the wrong number! a design consisting of two or more alphabetic letters combined or interlaced, commonly one’s initials, often printed on stationery, embroidered on clothing, etc. Oh, but a monogram can be so much more than that. 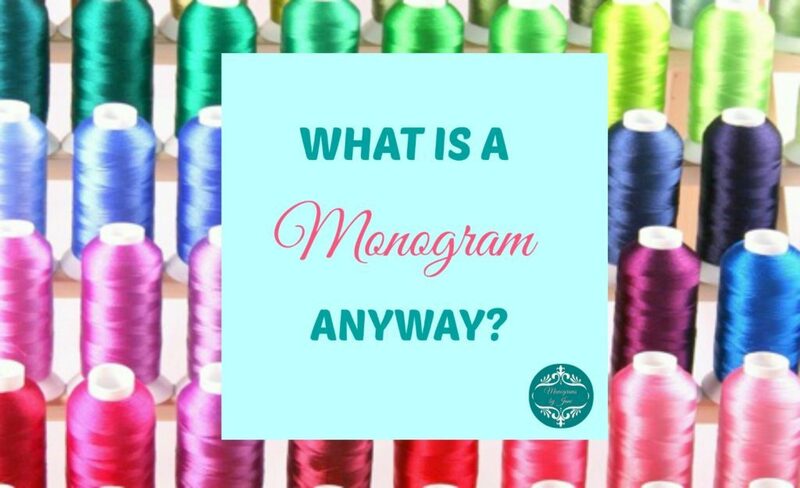 A monogram is so much more than thread embroidered in a certain shape or order. It’s your personal “brand”. When you put a monogram on something, you make it your own. Back in the day, cavemen decorated their clothing with beads, feathers, dyes and fur. It was a major effort to make simple clothing. By decorating their clothing, they demonstrated that they were well off. They had the time to do more than just hunting and gathering.